THIS IS THE SECOND PAGE OF DOCUMENTS FOR THE SECOND HALF OF 1930 on Nicaragua's Caribbean Coast region, housing materials dated during the months of October, November & December. Month after month, the astute Col. Marston reports on the devastation & misery wrought by the economic depression, and, remarkably, in the requisite categories, reports: "Friction between Guardia and civil population: NONE … Civil attitude toward the Guardia: GOOD … Attitude of press toward Guardia: FAVORABLE". With local elections slated for early November, much attention is devoted to political affairs and the Guardia's supervisory electoral role. Given these conditions, the absence of organized violence of any magnitude in the Coast is striking & stands in sharp contrast to Las Segovias during this period. Meanwhile on the western frontier, with the Neptune & other interior mines under continual threat of attack by rebels, much ink is spent on how, exactly, to protect them. In the end, Henry Springer, President of the Bonanza Mines Company, cuts a deal with the Guardia to split the cost (26 Nov). General McDougal offers a realistic assessment of the ungovernability of the Upper Coco & indeed of much of the interior (15 Dec), while J. A. Fisher of the Moravian Church in his annual report waxes despondent on the backsliding & lack of Christian charity among many of the converted (31 Dec). The land dispute between the communities of Bilwi and Karata (20 Nov) offers a telling instance of Miskitu insistence on their “natural rights” as inscribed in law – a discourse vastly different than Sandino’s emphasis on patriots & traitors & invaders & defending the sovereignty of the nation. Meantime, Sandino begins to set in motion his planned spring 1931 offensive into the Caribbean Coast region (21 Nov & 20 Dec). Record of Events, September 1930, Eastern Area, Col. John Marston, Bluefields, to Jefe Director GN, Managua, p. 1. Record of Events, September 1930, Eastern Area, Col. John Marston, Bluefields, to Jefe Director GN, Managua, p. 2. Record of Events, October 1930, Eastern Area, Col. John Marston, Bluefields, to Jefe Director GN, Managua, p. 1. Record of Events, October 1930, Eastern Area, Col. John Marston, Bluefields, to Jefe Director GN, Managua, p. 2. Letter from John F. Muller, New Orleans LA, to Mr. Dana G. Munro, Department of State, Washington D.C. "New Orleans, La. ¶ November 8, 1930. ¶ Department of State, ¶ Washington, D. C. ¶ Mr Dana G. Munro, ¶ Chief, Division of Latin American Affairs. ¶ Dear Sir: ¶ Your letter in answer to my telegram and later communications for protection of my Brother and his family located on the Wanks or Coca River Cape Gracias Nicaragua received some time back. ¶ I have just received a communication from those parts stating that an Officer and six soldiers was sent on the River and made an investigation they stayed only a short time and returned to Puerta Cabeza. I find that they did not get any information as the people was afraid of being punished or killed if the bandits found they had gave out any information against them. I have been informed that the bandits have control of the upper river as far as Wasspook Mouth. ¶ No doubt you have had a report from the Officer making the investigation as to conditions. ¶I am again asking for protection of my brother and his family, their lives are in danger, they had to leave their plantation on a few minutes notice and cannot return as the bandits are near and have sworn to kill him for no other reason than that he served with the United States Marines, they are Americans. I fail to see why our Government cannot give American citizens full protection in Nicaragua especially those performed special duty serving their country. ¶ I am making a special request that my brother and his family be given full protection as an American should be given in any part of the world and at once before it is too late for this protection. What have we got gun boats for chase one of them to Cape Gracias from there send up the river several launches with Marines and wipe out the bandits make a clean sweep of it this time so there will be no comeback. ¶ Hoping that you can comply with my request ¶ Yours very truly, ¶ J.F. MULLER, 7806 Maple St."
Radiogram from Onofre Sandoval, Bluefields, to Dr. Enoc Aguado, Vice President of the Republic, Managua. "Guardias were withdrawn from the working mine Bonanza the only industry of Pispis district which subsist two villages. Property looted twice before. Bandits quartered at Bocaycito patrolling at two days journey to the mine undoubtedly they will loot the mine for a third time causing another claim against the Government as a result. Please take the matter up with the President to reinstall Guardia there. Manager of mine Henry Franklin Springer in a last effort comprises to subsist and pay five guardias armed with a machine gun and protected by the people. 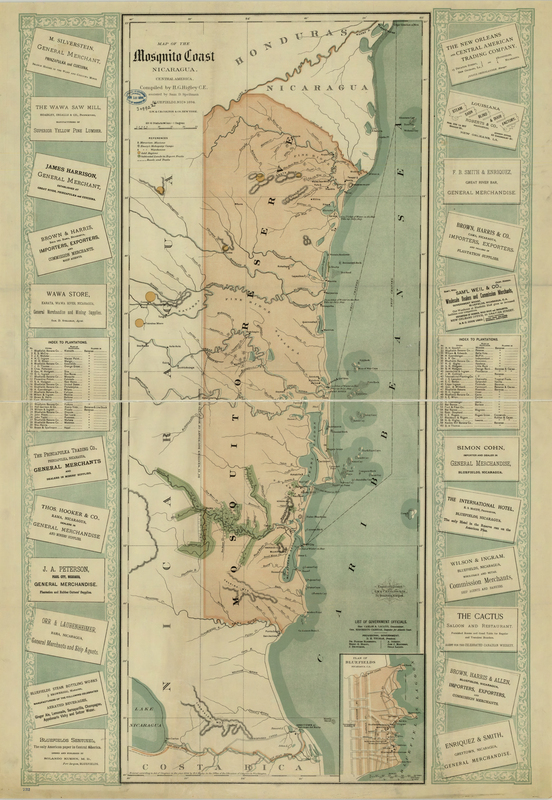 The hopeless situation of the East Coast claims measures of protection to life and interest." Radiogram from Henri F. Springer, Bluefields, to Jefe Director GN Gen. McDougal, Managua. "Work at Neptune Mine paralized. People are fleeing. Five men defending property. Bandits near. Request you to send guardias from here before bandits have time to sack mine as Guardia say have no orders. Thanks for your attention." Rights of Indians in the Bilwi-Karata Dispute, cable from British Consul Owen Rees, Bluefields, to Foreign Minister, London, p. 1. [NOTE: Consul Rees cable to London dated 29 Nov. 1930; his comment:] "This is quite unintelligible to me." 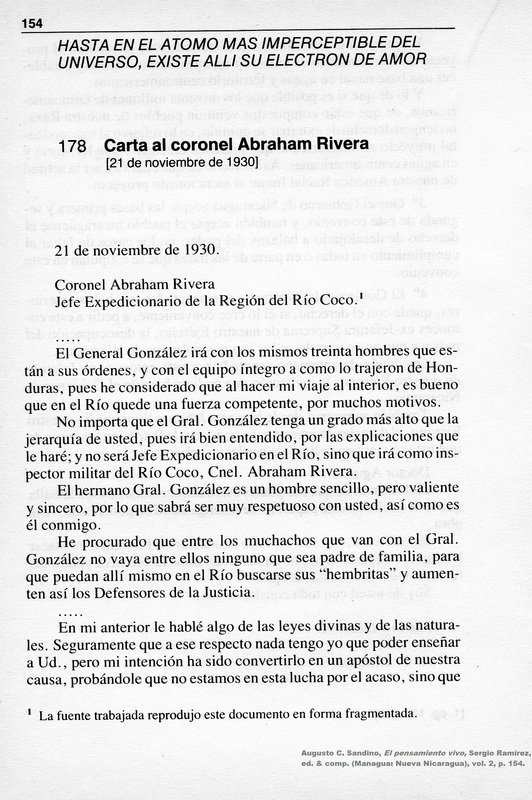 Carta de Gen. Augusto C. Sandino, Cuartel General del EDSNN, to Col. Abraham Rivera, Río Coco, p. 1. "... El General González irá con los mismos treinta hombres que están a sus órdenes, y con el equipo íntegro a como lo trajeron de Honduras, pues he considerado que al hacer mi viaje al interior, es bueno que en el Río quede una fuerza competente, por muchos motivos. ¶ No importa que el Gral. González tenga un grado más alto que la jerarquía de usted, pues irá bien entendido, por las explicaciones que le haré; y no será Jefe Expedicionario en el Río, sino que irá como inspector militar del Río Coco, Cnel. Abraham Rivera. ¶ El hermano Gral. González es un hombre sencillo, pero valiente y sincero, por lo que sabrá ser muy respetuoso con usted, así como es él conmigo. ¶ He procurado que entre los muchachos que van con el Gral. González no vaya entre ellos ninguno que sea padre de familia, para que puedan allí mismo en el Río buscarse sus "hembritas" y aumenten así los Defensores de la Justicia. 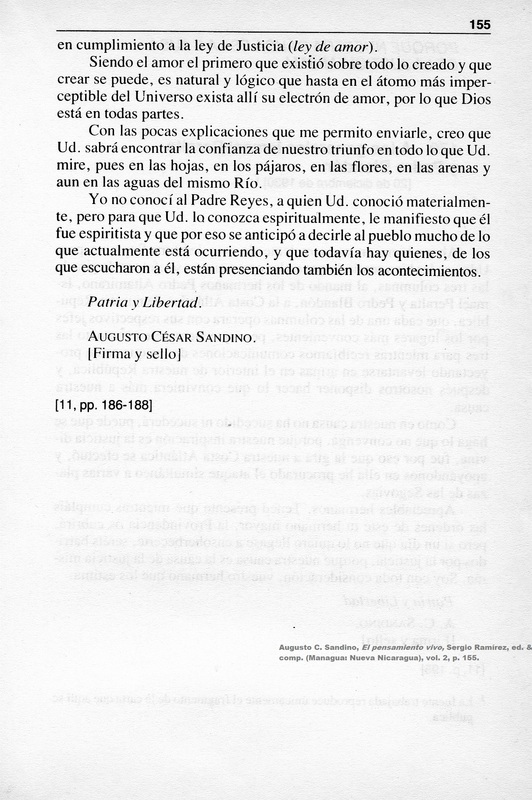 ..."
Carta de Gen. Augusto C. Sandino, Cuartel General del EDSNN, to Col. Abraham Rivera, Río Coco, p. 2. Area Special Order No. 17 - 1930. Col. John Marston, Bluefields. "1. NEPTUNE MINE post is hereby established at NEPTUNE, Nicaragua, in the Department of Northern Bluefields, Eastern Area, Guardia Nacional de Nicaragua. 2. This post will be garrisoned by eight rasos, one corporal, and one Noncommissioned Officer in Charge, total ten. ..."
Radiogram from Col. John Marston, Bluefields, to Jefe Director GN, Managua. 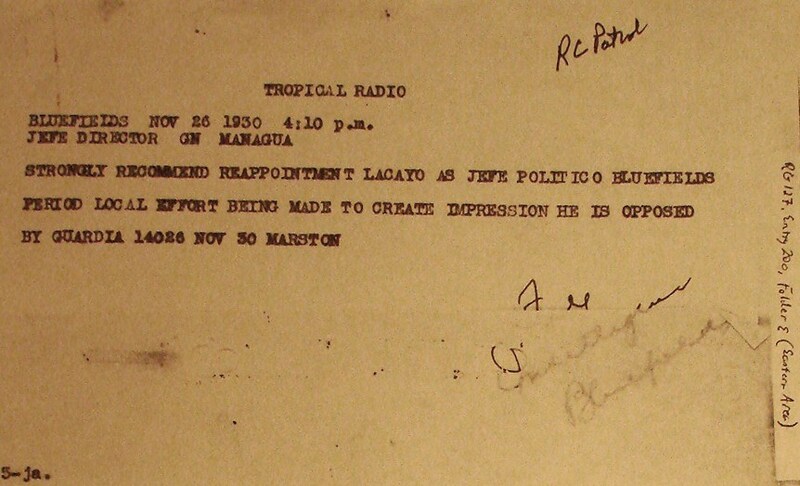 "STRONGLY RECOMMEND REAPPOINTMENT LACAYO AS JEFE POLITICO BLUEFIELDS PERIOD LOCAL EFFORT BEING MADE TO CREATE IMPRESSION HE IS OPPOSED BY GUARDIA 14026 NOV 30 MARSTON"
Record of Events, November 1930, Eastern Area. Col. John Marston, Bluefields, to Jefe Director GN, Managua, p. 1. "December 3, 1930. ¶ From: The Area Commander, Eastern Area. ¶ To: The Jefe Director, Headquarters Guardia Nacional de Nicaragua, Managua, Nicaragua. ¶ Subject: Record of Events, November 1930, Eastern Area. ¶ -2- ¶ SUBJECT : Record of Events, November 1930, Eastern Area. ¶ C. MILITARY OPERATIONS. (Continued) ¶ 12 Nov Lieutenant Schriber, USMC, Lieutenant Bowling, USN, Ph M1C1 Biggar, USN, and sixty-three Marine enlisted embarked on U S S ASHEVILLE for distribution to CANAL ZONE and MANAGUA. U S S ASHEVILLE left for CANAL ZONE. ¶ 13 Nov Two planes, Lieutenants Mc Quade and Young, USMC, pilots, Captain Best, passenger, left for MANAGUA. LIEUTENANT WITHERS, Commanding, with LIEUENANT MARTIN, the Seventeenth Company, (37 enlisted, 1 guide) left for MANAGUA, via schooner ROSITA. ¶ 14 Nov LIEUTENANT HOLDAHL, SERGEANS KIPP, HUTCHCROFT, RAGSDALE, and CORPORAL BELL and FRYE, USMC, joined Guardia Nacional by transfer from Second Brigade, USMC, and assigned to duty with Headquarters Detachment, Eastern Area. ¶ 18 Nov CAPTAIN WOOD left on inspection trip to LA CUZ, EL GALLO, and RIO GRANDE BAR, via Cuyamel Fruit Co Barge No. 2. 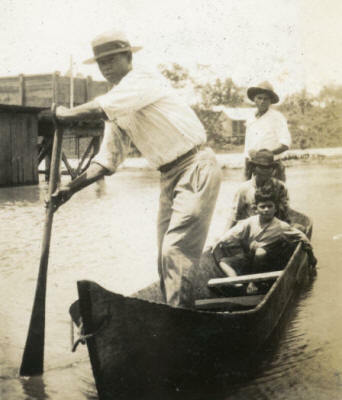 ¶ 21 Nov CAPTAIN WOOD returned from inspection of LA CRUZ, EL GALLO, and RIO GRANDE BAR. ¶ 26 Nov Acting CAPTAIN HOLDAHL and Acting LIEUTENANTS KIPP, HUTCHINCROFT, RAGSDALE, BELL and FRYE left BLEUFIELDS for MANAGUA Via schooner ROSITA. ¶ 27 Nov LIEUTENANT RIEWE and ten enlisted left BLUEFIELDS via schooner ULTRAMAR, under orders to establish permanent post of NEPTUNE MINE, in the Department of Northern Bluefields. ¶ 2. Military duties performed. Police of EA, and military training of personnel. 3. No enemy contacts. ¶ D . POLICE OPERATIONS ¶ 1. See Departmental Reports. ¶ 2. General Police Conditions. QUIET. ¶ E. INTELLIGENCE. ¶ 1. General state of territory occupied. QUIET. ¶ 2. Military situation. No known enemy in this Area. ¶ 3. Economic Conditions. ¶ The economic depression noticeable throughout the entire republic is probably having a more serious effect upon the residents of the East Coast than any other part of the country. The chief agricultural product here is the banana. Very few other products are grown. Corn is not a staple article of food, and garden vegetables are practically unknown. The small quantity of rice grown at PEARL LAGOON and the few beans grown along the river banks during the dry season, when the water is low, have no significance as a source of general food supply. [...]"
Record of Events, November 1930, Eastern Area. Col. John Marston, Bluefields, to Jefe Director GN, Managua, p. 2. "[...] SUBJECT: Record of Events, November 1930, Eastern Area. ¶ E. INTELLIGENCE. (Continued) ¶ 3. Economic Situation. ¶ The principal foods on this coast are rice and beans, generally fried with lard. All three of these foods, (rice, beans and lard), are imported from the United States or Colon, except some of the bean supply which comes down the San Juan River from the “Interior”. ¶ As a consequence, no one eats the usual diet on this coast unless money is available for the purchase of the food. Green bananas can be boiled in an emergency and can, I suppose, support life for a considerable period, but the East Coaster prefers, and must have rice and beans. I am inclined to believe that the lack of local food produce is due to climatic conditions, (the heavy rains making it a difficult matter to raise most crops), and not, as many believe, due to indolence or indifference. ¶ I have noticed on my inspections the ragged and tattered and ill-nourished appearance of hundreds of river dwellers who have lost their employment as workers with banana or mahogany companies. Under these conditions robbery and thievery and allied misdemeanors are certain to increase. Already two commissaries of the United Fruit Company subsidiary, The Cukra Development Company, have been robbed, and further depredations are to be expected. Thus, the reduction of the Guardia Nacional has come at a time when police conditions of the Area are making greater and greater demands upon the outlying posts of the organization. ¶ No serious disorders have yet occurred, but there is sufficient evidence to indicate a restlessness on the part of the laboring element, which may break out in violence at any time. There is growing resentment against the Government because of the high duties placed on food stuffs and other essentials of existence on the East Coast. ¶ 4. Friction between Guardia and Civil population: NONE. Civil attitude toward Guardia: GOOD. Attitude of press toward Guardia: FAVORABLE. The weekly newspaper, “THE AMERICAN”, Sr. Fernando Chamorro, P., proprietor, Dr. Jose Angel Romero Rojas, editor, started publication on November 1, 1930, in Bluefields. ¶ 5. Political Situation. The victory of the Liberals’ candidate in the recent elections, in Bluefields, was a conclusive one, but the Conservatives feel that they made an excellent showing. Heberto Correa, the Labor-Independent candidate, obtained only a very few votes, indeed. The work done by the Guardia guards in connection with these elections was apparently thoroughly satisfactory to all concerned. [...]"
Record of Events, November 1930, Eastern Area. Col. John Marston, Bluefields, to Jefe Director GN, Managua, p. 3. "[...] SUBJECT: Record of Events, November 1930, Easter Area. ¶ E. INTELLIGENCE. (Continued) ¶ 6. Weather. Increasing rains, with cooler weather. ¶ 7. Condition of roads and trails. ¶ The existing trails are in poor condition. The first shipment of supplies of machinery for construction work on the RAMA – MANAGUA HIGHWAY has been received in the Customs at EL BLUFF. This shipment includes 151 crates of maerials, including 22 tram, dirt cars, with derrick and tractor parts and accessories. ¶ 8. Condition of telephone and telegraph communications: GOOD. ¶ F. CONFISCATION OF ARMS. See Departmental reports. ¶ G. TRAINING. ¶ Improvement in routine drills has been obtained during the past month, and progress has been assisted by the recent discharge of fifteen rasos who did not come up to standard. Most of these discharges, for convenience of the government, were made in the Miskito Indian element. Particular attention has been given to emergency drills and exercises in rifle practice. ¶ H. MISCELLANEOUS. ¶ Four (4) Guardia deserted from the service, and two (2) were discharged “For convenience of the Government” during the period. ¶ The following inspections were made during the period, by the Area Executive. The conditions found at these posts were satisfactory, in general: - LA CRUZ, EL GALLO, RIO GRANDE. ¶ (Signed) JOHN MARSTON"
Letter from Gen. D. C. McDougal, Jefe Director GN, Managua, to American Minister Matthew Hanna, American Legation, Managua. "15 December 1930. ¶ My dear sir: ¶ Your letter of December 9th, enclosing a copy of a leter from Mr. Muller to the State Department, has been received. ¶ Mr. Muller has property at Waspuk on the Coco (or Wanks) River located approximately 140 miles up the Coco River from Cabo Gracias a Dios. This property is about 145 miles from the nearest Guardia post. The total value of supplies at Sang Sang (near Waspuk) is about $600.00 and at Waspuk, the supplies have a value of about $400.00, or a total of $1000.00. The remainder of the settlement consists of Indians with little or no property and who have lived for years under their own tribal system without police supervision. ¶ There are no organized bands of bandits in that vicinity but as the coco River is about 450 miles from its source to Cabo Gacias, there are at times bandits, as individuals or groups, who are somewhere on this river. 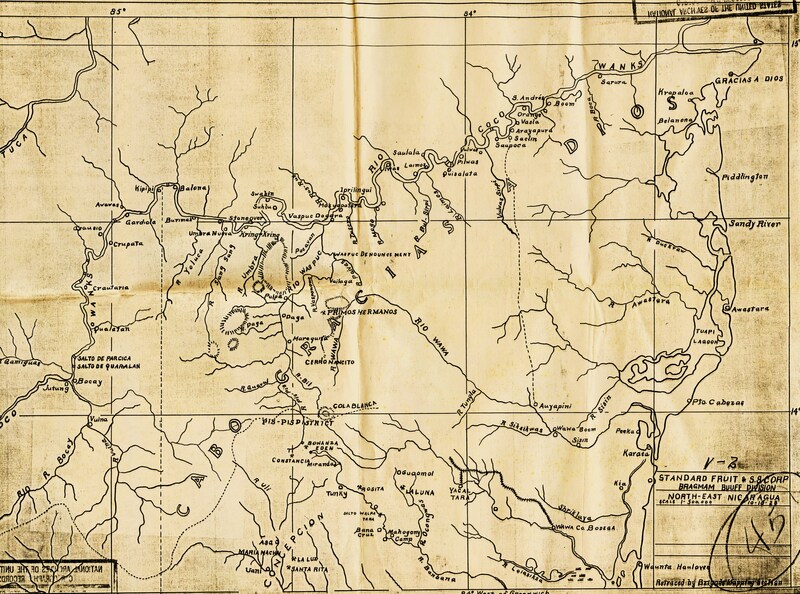 As the Indians are too poor to be an objective for bandit depredations on any scale, no leaders have operated in this region except when individuals or small groups use the river to pass to the East Coast. The East bank of the river is Honduran territory into which Guardia cannot operate. 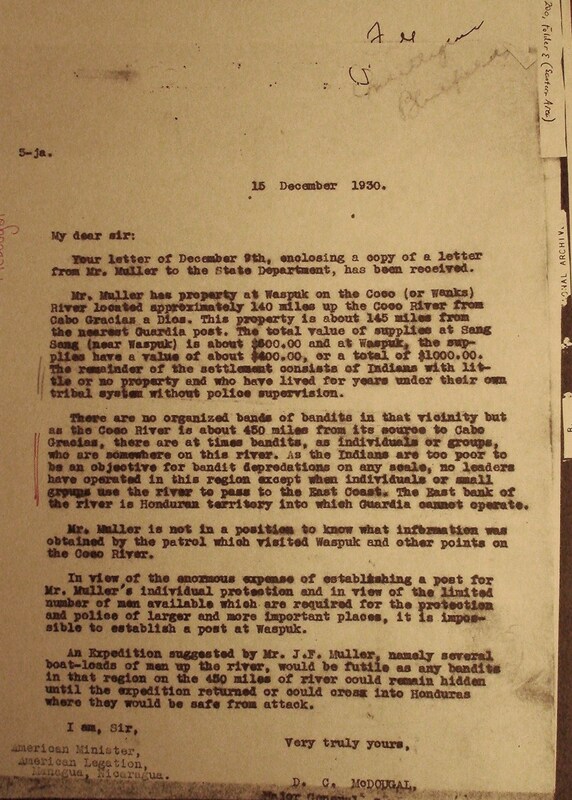 ¶ Mr. Muller is not in a position to know what information was obtained by the patrol which visited Waspuk and other points on the Coco River. ¶ In view of the enormous expense of establishing a post for Mr. Muller’s individual protection and in view of the limited number of men available which are required for the protection and police of larger and more important places, it is impossible to establish a post at Waspuk. 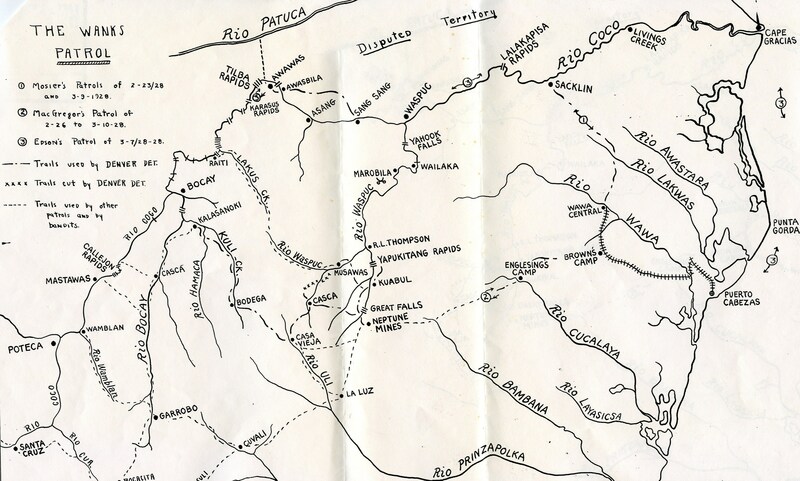 ¶ An Expedition suggested by Mr. J.F. Muller, namely several boat-loads of men up the river, would be futile as any bandits in that region on the 450 miles of river could remain hidden until the expedition returned or could cross into Honduras where they would be safe from attack. ¶ I am, Sir, Very truly yours, ¶ D. C. McDOUGAL." 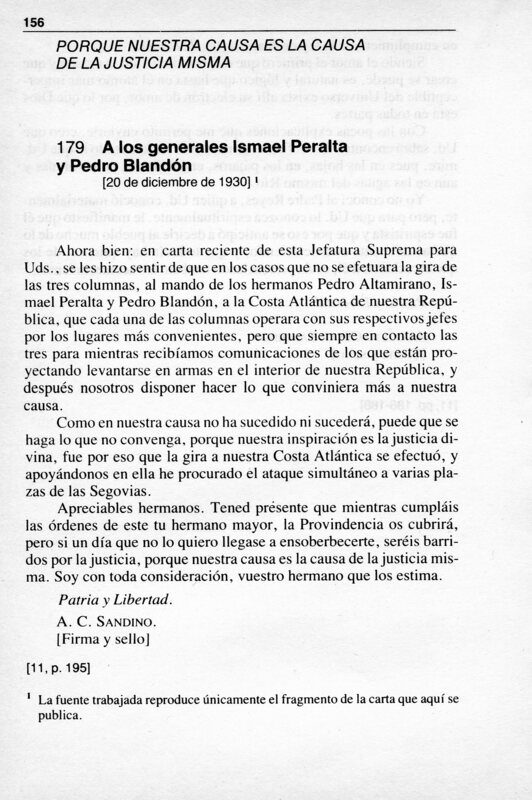 Carta de Gen. Augusto C. Sandino, Cuartel General del EDSNN, to Gens. Ismael Peralta & Pedro Blandón, sus campamentos. "... Ahora bien: en carta reciente de esta Jefatura Suprema para Uds., se les hizo sentir de que en los casos que no se efetuara la gira de las tres columnas, al mando de los hermanos Pedro Altamirano, Ismael Peralta y Pedro Blandón, a la Costa Atlántica de nuestra República, que cada una de las columnas operara con sus respectivos jefes por los lugares más convenientes, pero que siempre en contacto las tres para mientras recibíamos comunicaciones de los que están proyectando levantarse en armas en el interior de nuestra República, y después nosotros disponer hacer lo que conviniera más a nuestra causa. ¶ Como en nuestra causa no ha sucedido ni sucederá, puede que se haga lo que no convenga, porque nuestra inspiración es la justicia divina, fue por eso que la gira a Nuestra Costa Atlántica se efectuó, y apoyándonos en ella he procurado el ataque simultáneo a varias plazas de las Segovias. …"
Excerpts from Report of Haulover Station & Its Filials, Ending December 31st, 1930, J. A. Fisher, Moravian Church, p. 1. Excerpts from Report of Haulover Station & Its Filials, Ending December 31st, 1930, J. A. Fisher, Moravian Church, p. 2. Excerpts from Report of Haulover Station & Its Filials, Ending December 31st, 1930, J. A. Fisher, Moravian Church, p. 3.